Home News What is safety net? At Weihai Huaxing Nes we manufacture the fall protection safety netting to all of the world. All of the safety netting complies with the European Standard 1263-1. The nets are made from high tensile, multifilament polypropylene and are knotless. This form of construction means that the nets are flatter in catenary which reduces fall distance and also reduces the loads on both the fallen and the structure. At Weihai Huaxing Nes we value our customers highly and your satisfaction with our services from the first point of contact through to job completion is our priority. We offer a 24 hour turnaround service from receiving your email and call, to providing you with the information you have requested. Timing and the ability to harmoniously integrate all the various aspects of work to fit that timing, is the essence of a successful construction site. 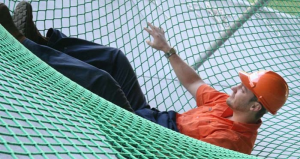 At Weihai Huaxing Nes we provide high quality safety nets to ensure the construction site worker safety. 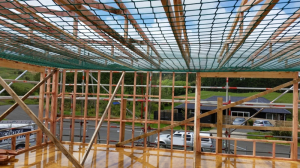 Once the construction netting is safely installed, work underneath can continue on unimpeded as the work above continues to progress safely. 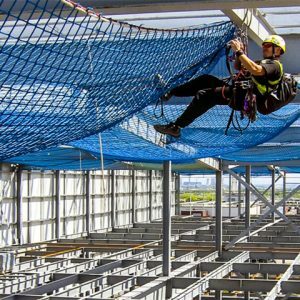 Weihai Huaxing Nes fall protection netting can also be used in conjunction with debris nets to contain debris and asbestos.